The existing church of St. Clement, built in 1295 and named St. Bogorodica Perivleptos, is a completely preserved medieval monument located in Ohrid, famous for its extraordinary architecture and fresco paintings. 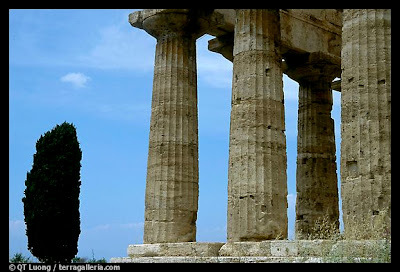 During the XIII century the Byzantine Empire was ruled by the Palaeologus dynasty, thus also the style of the church, which was erected in that period, is known as "Palaeologus". 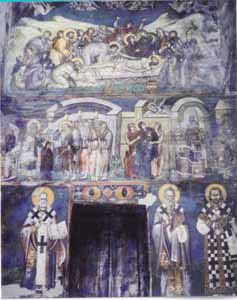 After the conversion of the church of St. Sofia into mosque, the church of St. Clement became the cathedral church of the Ohrid Archiepiscopate. 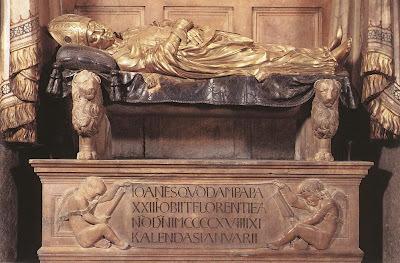 It retained that position until the discontinuation of the Archiepiscopate in 1767. 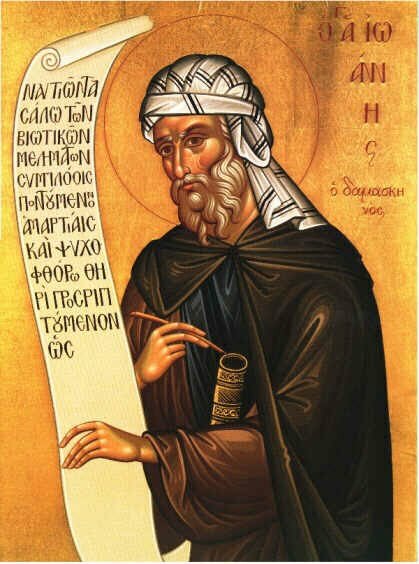 Its present name originates from the time when the relics of Clement of Ohrid were transferred there from the monasterial church of St. Pantheleimon, since that one too was conversed into mosque. 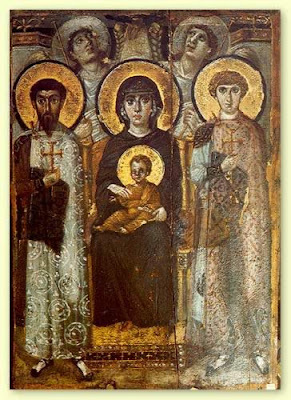 Many precious icons, manuscripts written in Slavonic or Greek language from the 10th century on, various relics, and religious clothes - all of these were relocated from the churches of St. Sofia and St. Pantheleimon to St. Clement. 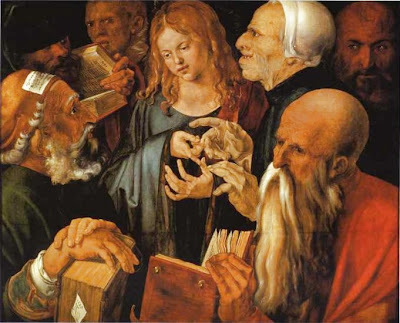 Thus this church became an unique treasury. 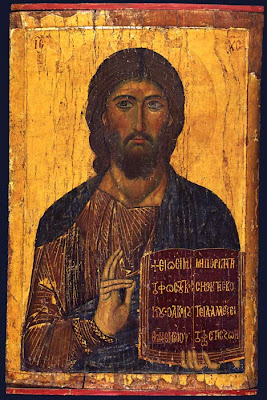 Till the present day numerous artifacts have been preserved, primarily the ones from the renown collection of Ohrid icons exhibited in the Gallery of Icons. 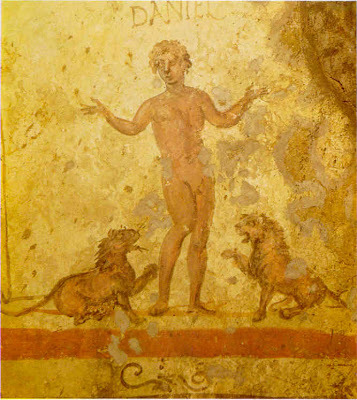 The frescoes in the church of St. Clement were gradually discovered, starting from 1950. They were covered with layers of dark soot generated by centuries long burning of icon lamps and candles. The icons were cleaned up by special emulsion made up of organic chemicals according to the recipe of the esteemed painter and conserver Zdravko Blazic. 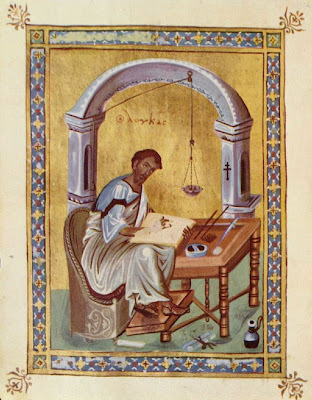 The authors of the frescoes were Michael Astrapus and Eutychus, two exquisite painters from the late XIII and the first half of the XIV century. 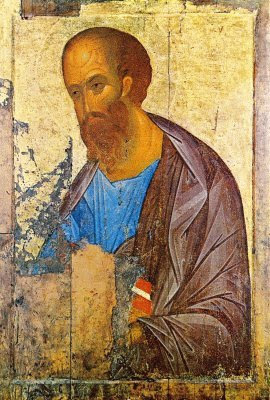 In 1295 these two fresco painters were commissioned to decorate the church by the Byzantine military commander Progon Zgur, a relative of Emperor Andronicus II Palaeologus, as inscribed on the interior wall above the entrance door. 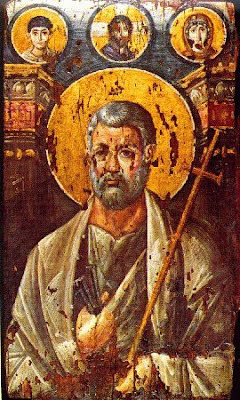 The painters skillfully incorporated their names within the clothes of St. Dimitry (Michael) and St. Procopius (Eutychus), and elsewhere. The frescoes of the church of St. Clement denote an entirely new chapter in the medieval arts. 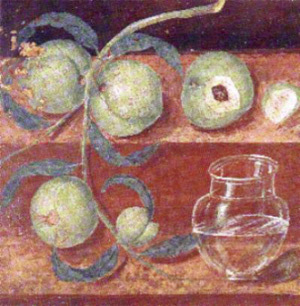 These frescoes mark the beginning of the new artistic aspirations in the Byzantine arts, known as the Palaeologus Renaissance. 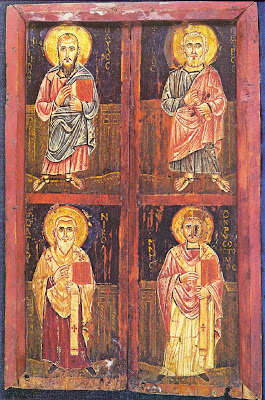 Moreover, the St. Clement's church frescoes are the earliest known and dated works of Michael and Euthychus, later the court painters of King Milutin. 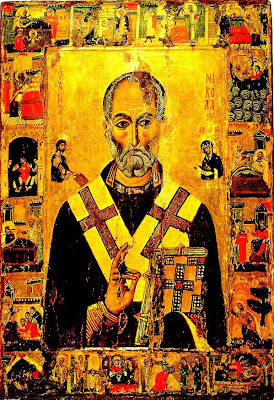 Their creative activities can be traced for almost three decades: from the church of St. Clement (1295), through the church of St. Nikitie (1307), to the one in Staro Nagoricani (1318), as well as in other churches. 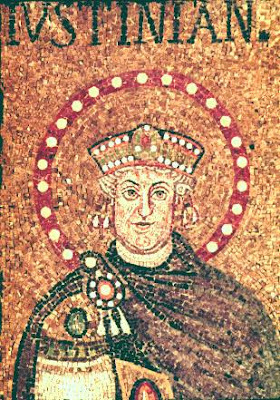 Mosaic detail showing the Emperor Justinian, 556 A.D. 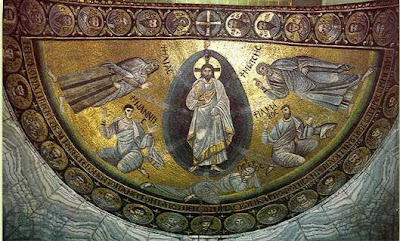 Although Justinian was alive when this mosaic was made, he nevertheless gets a nimbus (with Sassanid beads, reflecting the orgin of the symbol), which suggests his role as God's direct agent on earth. The effect of Justinian's take-over of Italy was not positive. Not only were the Gothic wars terribly destructive, but the powerful landowners continue to resist being governed. While the Lombard arrival did not affect Ravenna directly, it tended to isolate the area. We therefore do not see in Ravenna the neo-classicism then in fashion at the court of Constantinople. 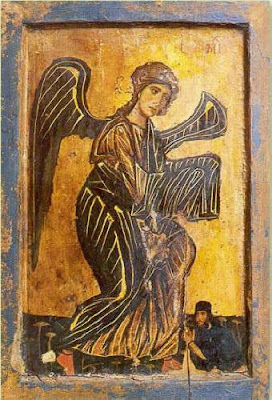 The Archangel Michael with the prostrate figure of a dedicated monk at his feet. 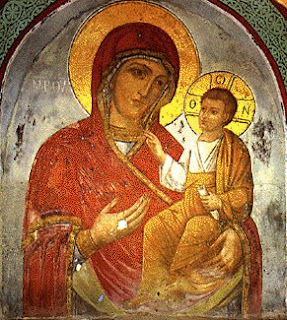 This portable icon dates to the 12th century. 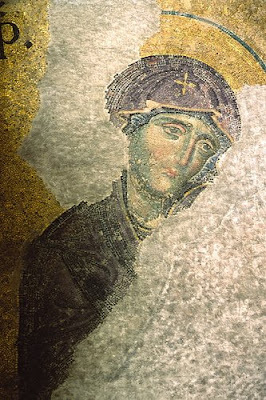 A pre-Iconoclastic depiction of St. Demetrios at the Aghios Demetrios Basilica. Note the dark blue tablion on his chest. 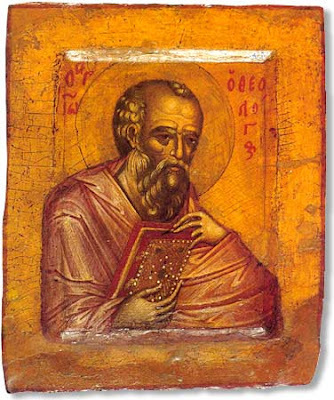 St. Demetrius was initially depicted in icons and mosaics as a young man in patterned robes with the distinctive tablion of the senatorial class across his chest. Miraculous military interventions were attributed to him during several attacks on Thessaloniki, and he gradually became thought of as a soldier: a Constantinopolitan ivory of the late 10th century shows him as an infantry soldier (Metropolitan Museum of Art). 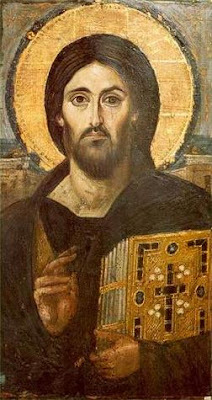 But an icon of the late 11th century in Sinai shows him as before, still a civilian. 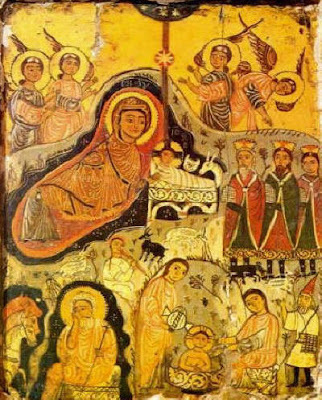 Another Sinai icon, of the Crusader period and painted by a French artist working in the Holy Land in the second half of the 12th century, shows what then became the most common depiction. Demetrius, bearded, rather older, and on a dark horse, rides together with St George, unbearded and on a white horse. Both are dressed as cavalrymen. Also, while St. George is often shown spearing a dragon, St. Demetrius is depicted spearing the gladiator Lyaeos, who according to legend was responsible for killing many Christians. 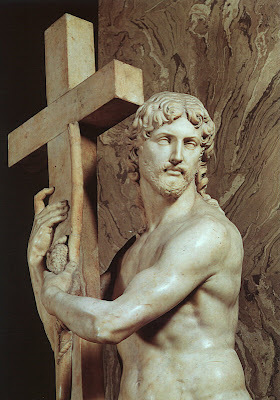 In traditional hagiography, Demetrius did not directly kill Lyaeos, but rather through his prayers the gladiator was defeated. A modern Greek iconographic convention depicts Demetrius with the White Tower of Thessaloniki in the background. The anachronistic White Tower acts as a symbolic depiction of the city of Thessaloniki, despite having been built in the 16th century, centuries after his life, and the exact architecture of the older tower that stood at the same site in earlier times is unknown. he was an expert historical novelist, with an ear for the authentic-sounding detail. 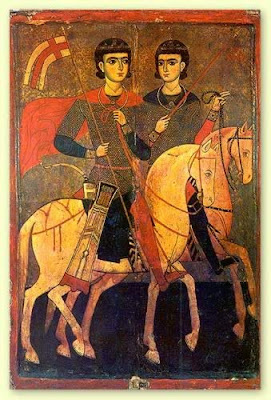 This is an icon of two military Saints, Sergius and Bacchus on horseback. 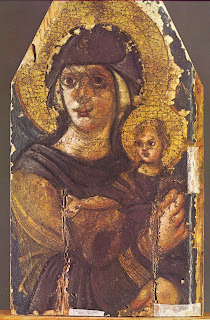 The large portable icon dates to the 13th c entury.